Our 12 y/o golden lab (mix) was hospitalized last year because of pancreatice and also found out she was diabetic. About 6 mo. ago we were introduced to Grandma Lucy's and found it to be the best food fix for her. She is healthy and very excited for breakfast and dinner! My Border Collie loves it. I interchange it with the other varities. I have been feeding my about to be 2 year old black lab this food for about 6 months now. She does amazing on it. She does her business twice a day like clock work with less bulk since everything is being absorbed and used. A super clean food, and I can tell you the rehydrated chicken tastes just like regular old cooked chicken breast. 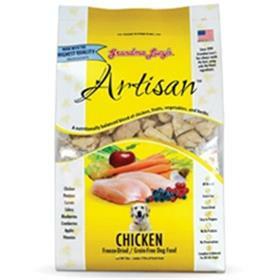 It is human grade ingredients, exaclty what I want to be feeding my pup.